Fluttering Butterflies: Introducing Hayley, my new guest reviewer! 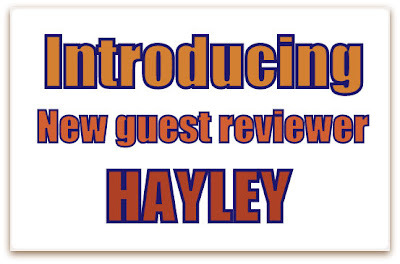 Introducing Hayley, my new guest reviewer! My name is Hayley and I'm a 20-something book addict. I work as a bookseller and I'm pretty much surrounded by books at all times. I love reading about books, browsing bookshops, going to author events and libraries as well as reading the actual books themselves of course! I read quite a wide range of books although mostly fiction. I love YA of course particularly contemporary stories. Probably my favourite teen author is Susane Colasanti although I also love John Green, Malorie Blackman, Meg Cabot, Lisa McMann, Kate McGarry, Simone Elkeles and many others! I also like reading crime novels and offbeat authors like John Irving and Chuck Palahniuk. I have experimented with writing a book blog a couple of times but can never quite manage to stay motivated with it. I love discussing books though so it is something I'd like to do one day, I just need to manage my work/life balance first. I'm really excited to be writing some guest reviews for Fluttering Butterflies as its a blog I've admired and enjoyed for a long time. My favourite book of all time is The World According to Garp by John Irving. In terms of YA I'd find it really difficult to choose a favourite, I generally like reading about characters who are outsiders or misunderstood in some way. I think I've worked through a lot of my own teenage angst by reading these books. I like books that are dealing with difficult subjects to, as a bookseller I think its really important for teenagers to have these books to turn to. I really commend writers like Ellen Hopkins for writing about mental health, abuse and drug addiction. If there's anything I'd like to see more of its books dealing with mental health and sexuality issues as I think these are really under-represented. Personally I'm not a massive fan of dystopian stuff so I'd like to see that trend recede to make way for some new stuff. So that's a little insight into what makes me tick, I look forward to sharing some of my bookish thoughts with you soon! Looking forward to reading some of your reviews Hayley!